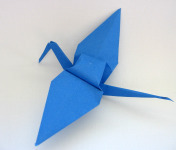 Here it is: the Icon of Origami—the most popular and well-known model, the origami crane. Some people call it an origami bird or stork, or swan. which is used in many models besides the origami crane itself. This page also includes instructions for the fun flapping crane. Click to see cutting tips. Task 1: Make a square base. 1. Start with a square base, also known as the prelimary fold. Position it with the open end toward you. Task 2: Make a crane base. 2. Grabbing two layers of paper, fold the lower left flap and lower right flap in to the center line. 3. Turn the model over. 4. Repeat Step 2, forming a kite shape. 5. Fold down the top triangle, making a crease from point to point across the model. 6. Unfold back into a square. You've formed "helper creases" that you are going to use in the next steps. 7. Carefully peel up the top layer of paper. 8. Begin to fold the top layer back on the cross-wise crease you made in Step 5. 9. Work your thumbs along the helper creases, so that the far edge begins to fold toward the center. 10. Continue gently speading the tips apart and folding the edges toward the center. 11. Begin to press the model flat. Watch those tips and keep them neat! 12. Turn the model over. 13. Repeat everything, starting with Step 5 where you fold the top triangle down. 14. Tah dah! The Crane Base. If you came here from other instructions on this site to make the crane base, please click your brower's Back button to return. Task 3: Make the neck, head, and tail. First, notice how the base consists of wings and two "legs." The triangle in between the wings will be the body. 16. Working with one of the legs, fold the top layer in half to the center. Tip: Notice how I use my thumbnail to help make a neat tip. 17. Important: If you are making a flapping crane, skip this step. 18. Turn the model over and repeat the previous fold(s). If you are making a flapping crane, it should look like the second photo, with one fat leg and one skinny leg. 19. Fold one of the "legs" up to where it attaches to the body. A "leg" is actually the neck and head (or tail). Whatever angle looks right to you is correct. 20. To make the next fold easier, also fold it to the back on the same crease. Crease well. 21. Unfold the last step, and stick your index finger in between the two layers of the neck (or tail). With the paper pinched between your thumb and index finger, flip the neck "inside out" and up using the crease you made. As you flip, slide your fingers up the neck, allowing your other hand to pinch the base of the neck back together. 22. The process you used to make the neck is called an inside reverse fold. Use the same process to make the head (on the skinny leg for a flapping crane). 23. Repeat Steps 19-21 to make the tail. If you are making a flapping crane, go to Step 26. 24. Fold one wing down to where it attaches to the body. 25. To finish the traditional origami crane, fold the other wing down. Then push both wings up to the desired angle. Congratulations! 26. For the flapping crane, the tail must still be "fat." Important: Gently fold the wings down all the way down to where they attach to body at both the neck side and tail side. Soft-crease only. 27. Push the wings up a little higher than horizontal. 28. To make it flap, grasp the front corner and the tail. Very, very gently pull the tail until it gets going. If you have trouble, try lowering the angle of the wings. Once it gets going, you can raise them to increase the range of motion. 29. 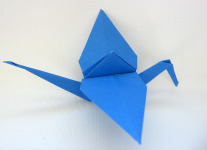 To give the traditional origami crane a puffy body, first insert your thumbs in the body to spread the layers. 30. Continue gently spreading and pressing down on the point until you achieve the shape you want. You can also try blowing in the hole on the underside to inflate the body like a balloon.